The HX400 Series transmitters provide remote and on-site monitoring of relative humidity and temperature. Each parameter is transmitted as a 4 to 20 mA signal to remote receivers. The HX400 is a programmable 2-wire field mounted humidity/ temperature transmitter for use in environmental air monitoring and system. Its state-of the art design combines digital capacitor humidity/temperature chip and microprocessor-based linearization with temperature drift compensation technology offering proportional, linear, and highly accurate dual 4 to 20 mA output current in a variety of applications. 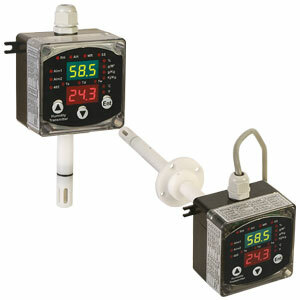 The HX400 integrates functions of transmitter, indicator and alarm outputs in one unit. All directly measured and computed parameters are configured via front 3 pushbutton without personal computer involved. Dual 3-digit 7-segments LED display module indicates the values of the measured parameters in measuring mode or prompting the programming instructions during setup mode and calibration mode. The current output models enable placing of the transmitter at a remote location virtually any distance away from the measuring device. The HX400 models feature built-in dual displays that indicate both humidity and temperature simultaneously.